After opposition leader Leopoldo Lopez was jailed, the Maduro government is now targeting another political nemesis, Maria Corina Machado. The world must take notice. BOGOTA — Thanks to a malleable and compliant justice system, Venezuela's socialist regime is about to silence another and perhaps the most outspoken of its political critics: former conservative legislator María Corina Machado. Like Leopoldo López, a party colleague jailed months before, Machado is accused of taking part in a supposed plot to assassinate President Nicolás Maduro. 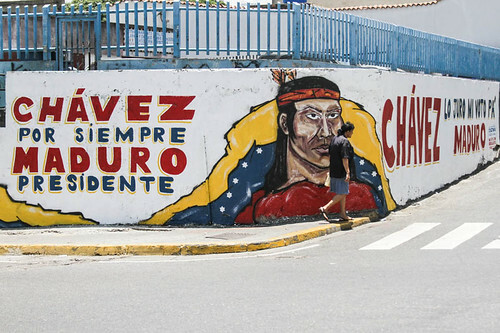 Everything suggests that the state appartus put in place by former President Hugo Chávez, who died last year after 14 years in power, will succeed in pushing this awkward, combative opponent out of its way — for now at least. Venezuelan prosecutors say Machado's emails were found to contain messages linking her directly to the alleged assassination scheme. She denies all charges. Another "suspect" in the plot, a political consultant named Pedro Burelli, has already used Google documents to show what he says is blatant forgery of the prosecutors' evidence. Burelli and other critics, including leaders in the Catholic Church, say the real source of these charges is the regime's determination to take out its active opponents, one by one. Some of those opponents have fled ahead of any possible prosecution. Examples include former Chávez challengers Henrique Salas Romer and Manuel Rosales. Another regime rival, Henrique Capriles Radonsky, spent jail time before being released and running for president, first against Chávez in 2012 and then, after the Venezuelan leader died of cancer, against Maduro last year. Leopoldo López, a former mayor of the Chacao district in Greater Caracas, was arrested 10 months ago. He is barred from political activity, meaning he won't be allowed to compete for leadership when and if he leaves prison. López took part in February 2014 in a protest that led to several deaths, arrests and torture. The demonstration was part of a string of protests that claimed dozens more victims, many of them students. At the time, Machado and López were working together, promoting street action as a way to channel opposition discontent. Regime critics have plenty to complain about, starting with crime, supply shortages of consumer goods, unchecked inflation and corruption. The state accused López of instigating the protests. Nearly a year later his legal situation remains unclear. In vain, the UN and several international bodies and personalities have asked the government to release him. The government is keener instead to move against Machado. First to attack her was Diosdado Cabello, the speaker of Venezuela's unicameral parliament. Cabello lambasted Machado, a member of the parliament, for violating the institution's rules when, in March 2014, she joined a Panamanian delegation in addressing the Organization of American States. Cabello moved to have her dismissed from her seat. Machado, who had made a number of high profile trips and appearances abroad, was also barred from leaving the country. Then came the accusation that Machado plotted to kill the president. Last week, she appeared before state prosecutors. She was later released but could very well end up in jail. There is a separation of powers in Venezuela, but events seem to follow a familiar script. The executive branch first publicly launches accusations at an opposition politician, state prosecutors then set about compiling formal charges, and the entire process is ultimately confirmed by the Supreme Court. Go figure! The Maduro government sees this as an oportune time to prosecute Machado given how deeply divided the opposition is. One sector, led by Governor Capriles, prefers dialogue. Capriles and his allies want to avoid giving the government pretexts for a clampdown. The other group, led by López and Machado, has opted for street protests. But with so much at stake, what's left to be done? The only path is to continue to pressure the Venezuelan government to respect due process and stop persecuting its opponents!